Home » Blog » Techniques » Flavor-Tripping: a Whole New Way to Taste! Flavor-Tripping: a Whole New Way to Taste! How would you like to change the flavors of everyday foods so drastically that you could get somebody drink vinegar and like it? Or what about sweetening your tea or coffee with just lemon? Sounds pretty cool, huh? Well, if you follow the lead of such genius chefs as molecular gastronomy chef Homaro Cantu, you’ll be sipping lemon juice in no time! His Chicago restaurant, Moto, offers a flavor-tripping experience with certain dishes using a curious little berry called a miracle berry or miracle fruit. 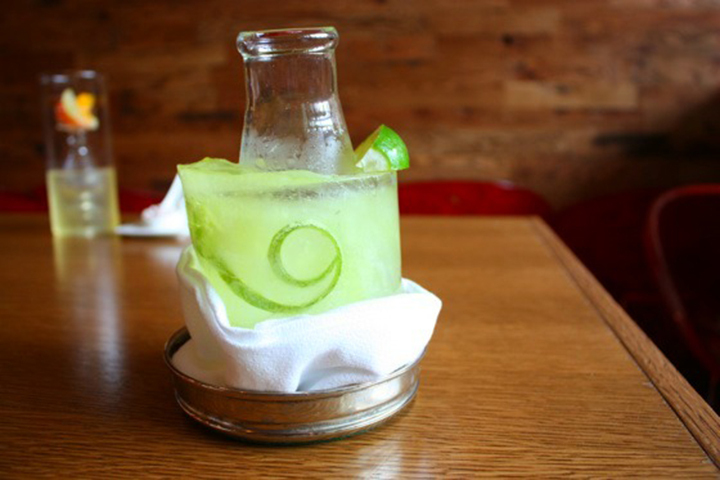 His flavor-tripping dishes and cocktails were so successful that Chef Cantu opened his restaurant iNG specifically to highlight the many uses of the miracle berry. The course starts out traditionally, with delicious taste and beautiful presentation, then halfway through the course, guests mull the miracle berry around in their mouths and continue eating, only to experience entirely different flavors from the very same dishes that they were just eating. Some of iNG’s signature flavor-tripping cocktails include a Gin and Tonic that is magically converted to a Sloe Gin Screw and a Champagne Fizz that Chef Homaro Cantu transforms into a Lemon Drop via use of the miracle berry. And all desserts at iNG are prepared without sugar but they taste as sweet as the real thing after rolling a miracle fruit tablet in the mouth. Chef Cantu's miracle berry research wouldn't have been possible without the help of mberry, the company that has been providing him with miracle berry products to experiment and to use with diners at iNG for its flavor-changing menu. His restaurants aren’t the only well-known places that are introducing the miracle berry to curious guests, either. Chefs and foodies across the country are inviting people into their homes and restaurants to experience what’s becoming known as flavor-tripping. After mulling a miracle berry tablet around in your mouth, lemons taste like lemonade, pomegranates taste more like cherries and olives taste like, well, sweet olives. But how is this possible? Thanks to the convenient miracle fruit tablets, now you can surprise your guests with incredible flavor-changing dishes. 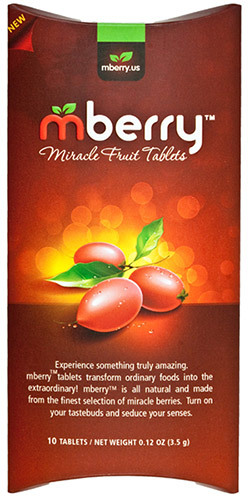 Genuine Miracle Berry fruit tablets are available in our store. Scientifically known as the Synsepalum Dulcificum, the miracle berry hails from West Africa and is now cultivated in Taiwan, South Florida, Puerto Rico and Ghana. The plant needs warm, acidic, near-perfect soil to thrive and doesn’t bear fruit for the first 2 or 3 seasons. It’s about the size of a large cranberry and tastes a bit sweet and tart. They’re not particularly flavorful and are usually only eaten for their taste-altering benefits. 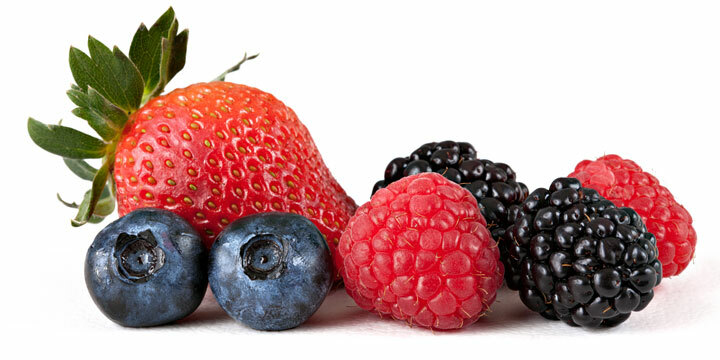 Miracle berries are organic, all-natural and non-GMO. How Does the Miracle Berry Work? Miracle fruit contains a protein called miraculin that temporarily blocks your sour taste receptors on your tongue and alters many other flavors including spicy, salty and bitter. The effect lasts between half hour to an hour depending on the individual and if liquids are consumed. - Guinness beer tastes like chocolate milk. Other beers are interesting too. - Dry white wines taste like a Riesling and reds taste more like a port. Now that you’re getting the idea, you can certainly see the possibilities and the intrigue! Basically, the only thing that limits what you can do with the miracle berry is your own imagination. Foodies and chefs are constantly on the hunt for new ways to make food interesting. The miracle berry is the perfect product for the culinary adventurous because it’s potential for new taste experiences is pretty much unlimited. Miracle fruit not only changes the perceived sweetness but could also bring out new layers of flavors. Flavor-tripping experiences are taking place formally at such places as iNG but have also invaded many homes across the country in the past few years. A great way to introduce your guests to flavor-tripping is to prepare a variety of different dishes and cocktails and then encourage your guests to try each food as it’s prepared. Half way through the course, simply have them pop the miracle fruit tablet, give it a few good swishes, and try the foods again! The result? Instant “oohs”, “aahhs” and squeals of surprised delight. Don’t feel as if you have to stick to traditional or individual flavors, either. The experience is truly a blast and though there are sure to be new or unusual flavors, that’s part of the fun! The flavor tripping cocktails and dishes at iNG are incredible. A "gin and tonic on the rock" is served in an Erlenmeyer flask with lime juice ice on the outside as you can see in the picture above. Under the influence of a miracle berry, the cocktail changes into a Sloe Gin Screw. At iNG, a Hot Toddy morphs into an alcoholic Arnold Palmer and a Margarita into a Tequila Sunrise. The "Blue Oyster Cult", shown above, is another interesting flavor tripping dish. 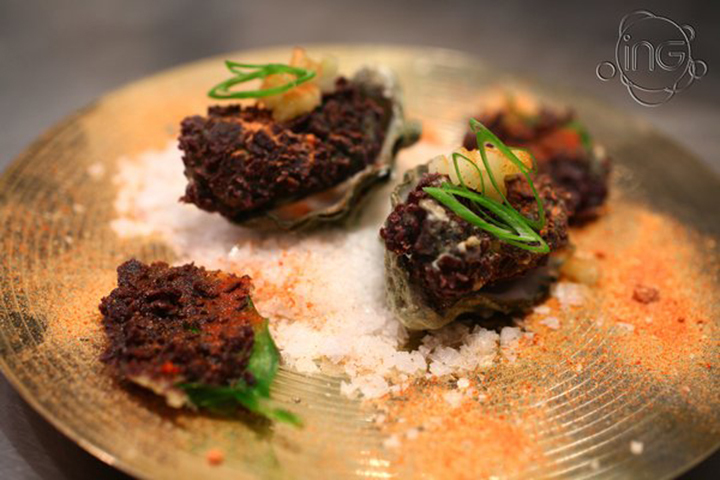 Oysters are coated with flour, egg wash, placed on an oyster leaf, covered in crumbled blue corn tortilla chips and fried. Lemon powder, tomato powder, shallots, horseradish, powder mignonette, scallions, pickled cucumbers complete the dish which is served on top of an upside down splash cymbal. The dish is paired with a chorizo infused vodka Bloody Mary. Diners are instructed to try an oyster and the cocktail, then consume the miracle berry before eating the rest for a complete different flavor experience. Flavor-tripping desserts could be great too! "May Flowers" is a surprising flavor changing dessert by Chef Homaru Cantu. Served in a small terracotta pot, it consists of a bottom layer of hazelnuts, covered with lime curd, then some vanilla cream, and finally topped with crumbled tea cookies that look like dirt. On top of the "dirt", some edible micro-flowers. This dish morphs from a key lime pie to an orange creamsicle after coating the tongue with miracle berry. How can You Add Flavor Tripping with Miracle Berry to Your Menu? When creating flavor-tripping dishes or cocktails, just make sure they don’t taste sweet (e.g. reduce the amount of sugar) and season them with acidic ingredients like lemons, limes, grapefruits, sour cream and vinegars as well as bitter ones. Also, pay special attention to background flavors as they may come forward and become protagonist after the miracle berry tablet is consumed. This will enhance the flavor changing experience after eating the miracle berry. For example, in his version of gin and tonic, molecular gastronomy Chef Homaru Cantu removes the tonic water and uses soda, water and lime. The challenge is to create a dish or cocktail that tastes incredibly good before and after consuming a miracle berry tablet. It really helps to taste ingredients individually to understand how they change under the influence of miracle berry. So get your miracle fruit tablets and start experimenting! An important issue to consider when serving a flavor-changing dish to a diner is what they are going to eat next, which will also be affected by the miraculin still in their mouth. Unless you are just having a flavor-tripping party with your friends, you don’t want to ruin the next course or the expensive wine that was carefully selected. But don’t worry, you have a few options. - Make the flavor-tripping course the final course of the meal. Great option if your flavor-tripping dish is a dessert. And the red wine will be perceived as a port or madeira that could pair perfectly with the sweet dessert. If you want to offer tea or coffee at the end of the meal, you could also sweeten them with lemon juice. - Adjust your next course so that it tastes great after eating a miracle berry tablet. If you make both courses last at least 45 minutes or so, the effect of the miracle berry will start to dissipate. Recommend the guests to drink water. - The best way to remove the effect is by drinking any hot fluid. So after the flavor-tripping dish you can serve a palate cleanser such as a lightly brewed green, black, or mint tea, with no sweetener. You could also serve a hot broth, dashi or cocktail made at the table with a hot infusion siphon. That same broth could be used in the next course too. 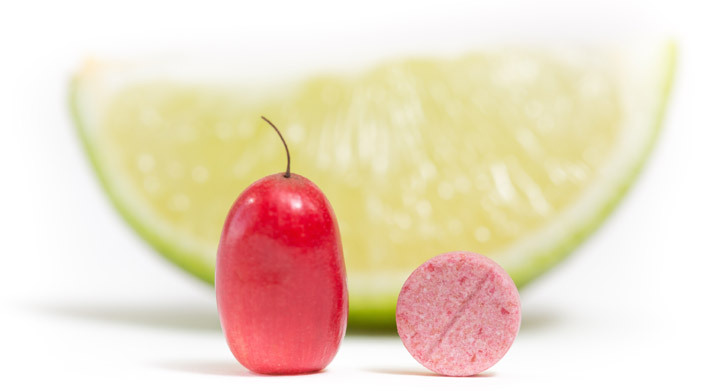 Miracle Berries or Miracle Berry Tablets? Though it’s great to use fresh miracle berries, there are a few downsides. First and foremost, the miraculin starts to degrade as soon as the berry is picked. By the time that it’s packed, shipped and sits on the shelf, you probably aren’t working with an optimum product. Miracle berry tablets are made from fresh berries that are freeze-dried as soon as they’re picked so you’re getting maximum levels of miraculin. Another consideration is cost. A single miracle berry will cost you anywhere from $2 to $7 so if you have 20 or 30 guests, your party can get pricey. Each double sized miracle fruit tablet has the same amount of miraculin as 3 berries and you can cut them in half to get two servings from each. Each tablet runs about $1 to $2. Since there are 2 servings in a tablet, that’s only 50 cents to $1 per serving and you know that you’re getting optimal effect. As you can see, there are numerous benefits to using Miracle Berry fruit tablets instead of trying to obtain quality fresh miracle berries. Aside from the fun and experimental things that you can do with the miracle berry, there’s also the potential to use it as a means to decrease sugar intake. As a matter of fact, at iNG, chef Cantu doesn’t use sugar in his desserts at all. Instead, he uses such ingredients as vinegar, agave nectar and lemons to sweeten his dishes. After his guests use miracle berry, the desserts taste every bit as decadent as they would if they were laden with sugar. Great for diabetics! And it can also work well for some cancer patients. Miracle berries neutralize the metallic taste in food and have been shown to alleviate some chemotherapy patients of the metallic taste that is left in their mouth due to the medicine they are taking. Make sure that you’re buying authentic Miracle Berry fruit tablets. They’re 100% natural and only contain freeze-dried berries and a small amount of starch to bind the tablet together. We’ve got authentic Miracle Berry fruit tablets in our store that will sweeten up your cheesecake and bring your flavor-tripping meals to life! Vanishing Cone, Micro Salad, Olive Oil Caviar » « Umami – The Delicious 5th Taste You Need to Master!